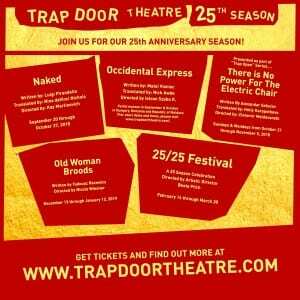 The Old Woman Broods, Trap Door Theatre, closes 1/19/2019. J. MICHAEL GRIGGS (BFA, Scenic Design, ’86) is the set designer. Sad Happy Sucker, Trap Door Theatre, closes 7/8/2018. LEE KIRK (BFA, Acting, ’96) is the playwright. Phedre, Trap Door Theatre, closes 2/11/2017. EMILY LOTSPIECH (BFA, Theatre Studies, ’03) is in the cast. J. MICHAEL GRIGGS (BFA, Scenic Design, ’86) is the scenic designer.